The Astronaut Helmet includes one helmet with "Space Explorer" logo. One size fits most adults. 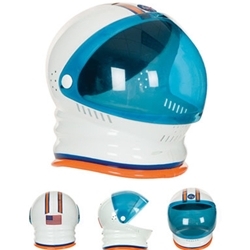 Blast off and explore the final frontier with this deluxe quality Astronaut Helmet. The full, over-the-head helmet is lined, and padded for comfort. Made of impact resistant polyurethane.